I’m willing to bet that PowerPoint is the number one source of boredom and frustration at work in America. But the new PowerPoint services offered by the 2013 release of the software should help things significantly. Very few people enjoy creating, delivering or sitting through PowerPoint presentations but it’s more than likely this is part of your daily routine, regardless of the business you are in. The 2013 PowerPoint services are a nice upgrade, helping the design and delivery of more compelling slides. Microsoft gave PowerPoint a nice overhaul in terms of look and feel of the software itself, going with a retro logo and overall design. The first thing that will strike you as you fire up the software to design a PowerPointslide is the new templates offered. Not only are you given a whole new set of template designs, but these are available in widescreen (16:9) by default. This is something we would have to do anyway but it took a few extra steps to configure for every presentation. Clicking on a template will give you a preview of the theme as well as variations of slides and colors you’ll be able to work with. This is definitely a nice feature, but as PowerPoint designers we tend to create them from scratch so this is not much use for us. It’s definitely nice as a source of inspiration. Microsoft divided each theme into families which enables multiple variations of a design. These template families are a huge help for those who don’t consider themselves PowerPoint specialists. When you put your presentation designer hat on you can decide to go with one template with the ability to change the fonts, colors, layouts, design elements, text properties and much more. You have unlimited control over the look and feel but PowerPoint helps you maintain a balanced look and feel. Microsoft also made sure that the themes could co-exist in the same presentations thus allowing you to input two or more templates into one presentation. This is especially helpful when you want to create distinctive parts to your presentation without having to play around with colors or mess up the overall layout. There are a few new tools to PowerPoint 2013. I wouldn’t necessarily call these exclusive PowerPoint services as most of them have been available on Keynote for a while but they are good news for PowerPoint. A majority of the work for PowerPoints specialists and amateurs alike, revolved around designing shapes or diagrams. Most of us used Visio to work on them, but the customization level was slightly restrictive to us. PowerPoint 2013 introduced a new feature which lets you combine existing shapes to create new ones. We have been playing around with this but it takes some getting used to. In the interest of maintaing the look and feel consistency while designing slides, they added an eyedropper tool to select colors from diagrams or pictures and apply them to shapes or text. Previous versions of PowerPoint enabled you to align shapes to each other but Microsoft took this to the next level, enabling you to align objects with text and other page elements using guides. A good PowerPoint designer will tell you that this had been available on Keynote for years now, but nonetheless this is a great feature to have on PowerPoint. Charts have been enhanced with the ability to import graphs and tables directly from Excel, while maintaining all the original functionalities. In addition, PowerPoint 2013 supports a number of new video formats as well as musical playback over more than one slide. This is a PowerPoint service which should save us considerable wire-framing work as we will not have to time voiceovers any longer. The presenter view in itself is a major upgrade. The speaker will now have the ability to see the content of the slide on the primary display and the speakers nots on another one. The speaker has the ability to zoom into various elements of each slide, giving his audience more insight into the current topic of conversation. There is a feature to navigate to different parts of the presentation, such as appendices. Overall the presenter view looks slick and is truly oriented towards the speaker, making their demanding job a hint easier. If you haven’t used presenter view before, it’s a feature that let’s you view two different aspects of a slide when presenting on a projector or a wide screen. It has a slight learning curve, but it increases the efficiency of a speaker tenfold once mastered. 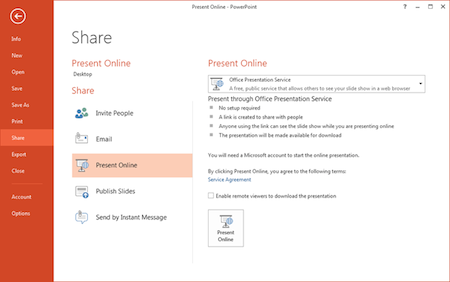 The final noteworthy element of the new PowerPoint 2013, which I would consider the greatest PowerPoint service so far is their new sharing platform. Microsoft is calling this the Presentation Service. In simple words, it enables you to present to an online audience with interactive communication channels like IM and other collaboration tools. The experience is seamless on the presenter’s side but requests a somewhat tech savvy audience. Again their is a significant learning curve to this but in the end you are able to interact in a more engaging way without having to use subscription based online presentation tools. The integration with Office.com let’s you insert pictures directly from Facebook or Flickr, but this is mostly a gimmick that a serious powerpoint designer would probably never use. 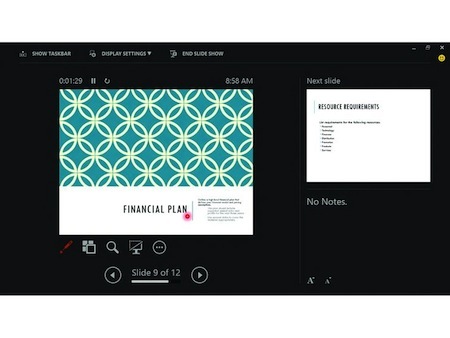 Accessing the online presentation service is as easy as saving a document. Simply click File > Share > Present Online and follow the instructions. You can share the link to your conference by copying it and sending it via email or IM. When your audience is ready you simply press “Start Presentation”. Moreover, your audience doesn’t need to have PowerPoint installed on their desktop as the presentation is streamed directly online. PowerPoint 2013 allows for collaboration work, with multiple people working on the same presentation, commenting on slides and chatting in real time. We have not yet tested these features so we cannot comment on their efficiency. All in all, we really appreciate the small UI and design changes that have been made to this new version of PowerPoint. Of course most of the elements we reviewed today won’t matter to most. If you weren’t able to create a well designed, compelling presentation before, the new Powerpoint services will not be much help. We really love the move towards widescreen presentations by default which shows an actual evolutions of Microsoft’s design sense. PowerPoint’s new Presenter View is a major improvement for anyone using it and the new collaboration tools will be a huge improvement to previous versions. Despite these brilliant new features we don’t expect a revolution in PowerPoint design anytime soon. Professional presentation designers will most likely be around for a few more years.